Luxury 3 bedroom apartment of 125m2 located just meters from the beach in the heart of tourist area of Limassol. A truly luxurious apartment with two bathrooms, a magnificent lobby, private parking, central air conditioning DAIKIN, underfloor heating, fireproof security entrance door, central satellite system and a common roof garden with sunbeds, a pergola and a barbeque. The apartment is equipped with PVC windows KOMMERLING, German kitchen ALNO, Italian doors and wardrobes SANTAROSSA, sanitary IDEAL STANDARD, ATLAS CONCORDE ceramic tiles and has provisions for a Smart house system. 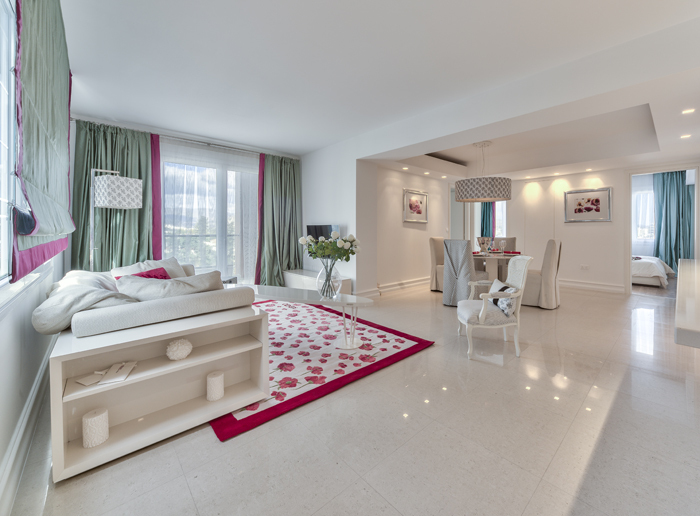 It is completely furnished with the finest furniture designed by KENZO and fitted with MIELE home appliances. This magnificent all luxury apartment also enjoys the finest sea and mountains views. The property can be paid for with a fixed deposit at the Bank of Cyprus.